From 3rd to 7th, 2011, two “Mobile Tourist Tribunals” successfully settled 68 cases of complaints and coordinated other departments to settle 12 cases of tourist disputes during the Chinese New Year holiday, reports hainan.net. 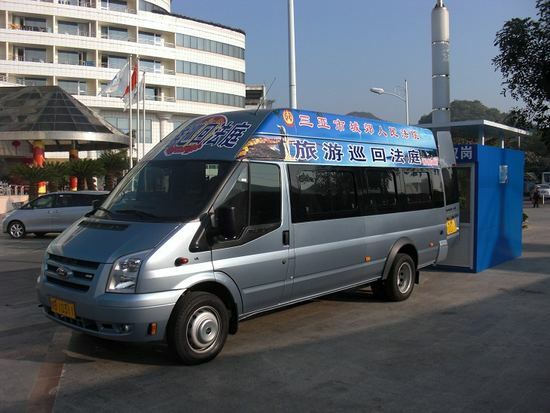 During the period, the mobile tourist tribunals came into service across major scenic spots in Sanya including Nanshan Cultural Tourism Zone, Dadonghai Beach and Sanya Bay. The mobile tourist tribunals, which are equipped with high-tech devices, aims to provide speedy justice to tourists in scenic spots or downtown areas. To better educate the public of the law knowledge, the mobile tourist tribunals also distributed 480 pieces of law materials to the public and provided consultation service for 202 people during thCNY holiday.